Demands for aircraft with enhanced safety is increasing as the projected growth in air traffic also involve the risk of more accidents. Responding to frequent natural disasters and meeting the ever-diversifying needs in the field of crisis management as flexibly and quickly as possible, meanwhile, will require safer and more efficient use of both manned and unmanned aircraft. The STAR program encourages R&D that makes aircraft operation safer and helps ensure the safety and security of society through the use of aircraft. Examples include detection, prediction, and prevention technologies to protect aircraft operations from the threats of special weather conditions (turbulence, snow and ice, lightning, and volcanic ash, etc.) and human error, which represent the major causes of aircraft incidents. Not only will the R&D thus make aircraft operation safer and more efficient, but technological transfers of the research outcomes will also benefit the international competitiveness of Japan's equipment manufacturers. Other focus areas include the R&D of integrated aircraft operation management systems for disaster relief and crisis management, which aims at improving the efficiency and safety of aerial capabilities in responding to natural disasters and managing crises (security and warning frameworks, for example) through the integrated and efficient use of aircraft, satellites, and other aerial assets. The effort also involves work on technologies for operation management and fl ight capability enhancement, which aim to make more effective use of helicopters and unmanned aircraft. All together, the program aims to help create a safer, more secure society on a far-reaching scope. 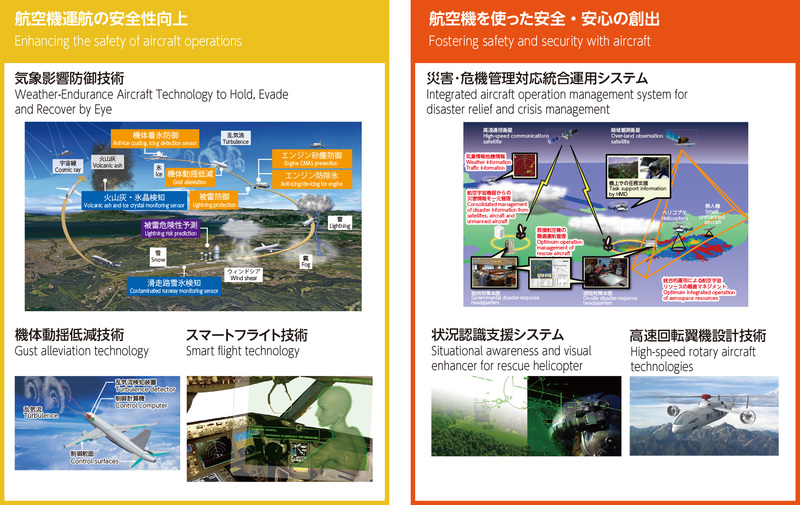 JAXA has been developing technlologies required for the implementation of the "Integrated aircraft operation system for disaster relief system", which is to contribute to safe and efficient operation of disaster relief aircraft and collection and sharing of disaster information through integrated operations of manned aircraft, unmanned aerial vehicles (UAVs), and satellites. In doing so, JAXA's goal is to contribute to strengthen the nation's ability to respond to future disasters. JAXA is developing "airframe safety management technology", a system that detects, predicts and administers the state of each airframe more effectively. The system can effectively sustain reliability of airframe safety against external factors, such as icing, lightning strikes, gusts of wind, hard landings, bird strikes, collision with foreign object and more. JAXA has researched and developed a novel air-traffic management system that is ready for future increases in air traffic, as well as a system that allows information sharing among numerous deployed relief aircraft and with a disaster-relief headquarters in the event of a large-scale disaster. JAXA works on the development of a small unmanned aerial system that is suitable for radiation monitoring by using a small long-endurance UAV equipped with a radiation detector that Japan Atomic Energy Agency (JAEA) has been using on unmanned helicopters and/or with another detector with improved real-time monitoring features. FLIGHT PATH No.3/4 "What goes into the safety at the heart of the STAR?"